Lightly grease 12 (1-cup) ramekins or 1 (13x9-inch; 3-quart) glass baking dish with shortening or spray with cooking spray. In 1-quart saucepan, cook butter, brown sugar and honey over medium heat until sugar is dissolved. Pour sugar mixture evenly into bottom of each ramekin. Top each with peach slices. Top peaches with layer of bread cubes, using about half of the bread. Top evenly with cream cheese cubes. Top with enough bread cubes to completely fill ramekins (you may not use all the bread). In large bowl, beat eggs, milk and 1/2 cup whipping cream with whisk until well combined. Pour evenly over bread in ramekins. Cover ramekins with plastic wrap; refrigerate at least 8 hours or overnight. In morning, uncover ramekins; let stand at room temperature 30 minutes. Meanwhile, heat oven to 350°F. Place ramekins on cookie sheets with sides or very shallow baking pan. Bake about 30 minutes or until golden brown and toothpick inserted in centre comes out clean. Remove from oven; place on cooling racks. Cool slightly. Meanwhile, in large bowl, beat 1 cup whipping cream, the icing sugar, cinnamon and vanilla with electric mixer on high speed until stiff peaks form. 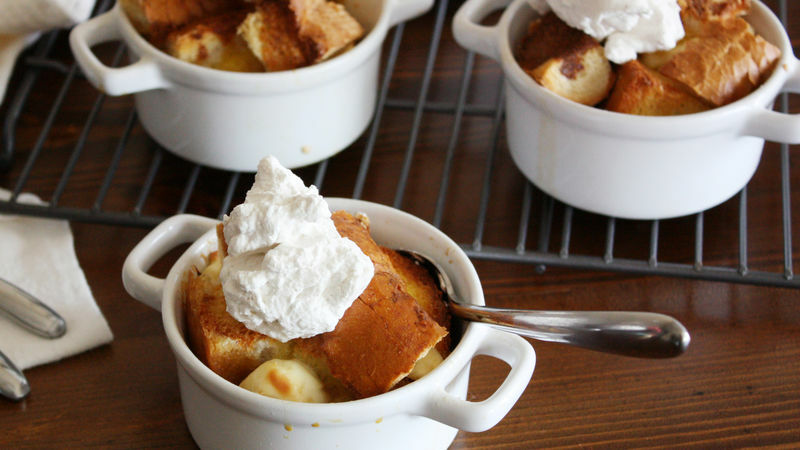 Dollop casseroles with fresh whipped cream; serve warm. Store in refrigerator. Fill the ramekins with a little more filling than you think you need; the bread will sink a little bit overnight while it soaks up the egg mixture. You can use peeled fresh peach slices in place of the canned ones, if desired.